The Internet of Things (IoT) is an extension of the Internet that interconnects Things with the people and computers already there. It’s a new paradigm increasingly underpinning our economic activity and way of life, with Ottawa in the thick of things, and fast becoming a world-class center for IoT. Despite the popular notion of IoT as interconnected sensors, or fridges talking to stoves and generating lots of data, the IoT space is much broader, with multiple dimensions, and far-reaching effects and consequences. Such physical devices or things are just a small part of the IoT architecture that must also transmit, store, and manage the data, and have the capacity to interpret and act on that data. That necessitates networks, cloud and data centers, analytics and controls software, and human interactable applications as part of the architecture. However, like a hammer, an IoT architecture is only a means to an end, and not the end itself. It’s just one dimension of the IoT space, with the real value determined by how it’s used and applied. IoT application or solutions verticals such as autonomous vehicles, smart cities, health, precision agriculture and others constitute another important IoT dimension. Though the architecture and verticals comprise the means and values of IoT, they are enabled by innovations in a plethora of domains and disciplines, and in return drive impact and transformation in other domains of human and societal endeavours. 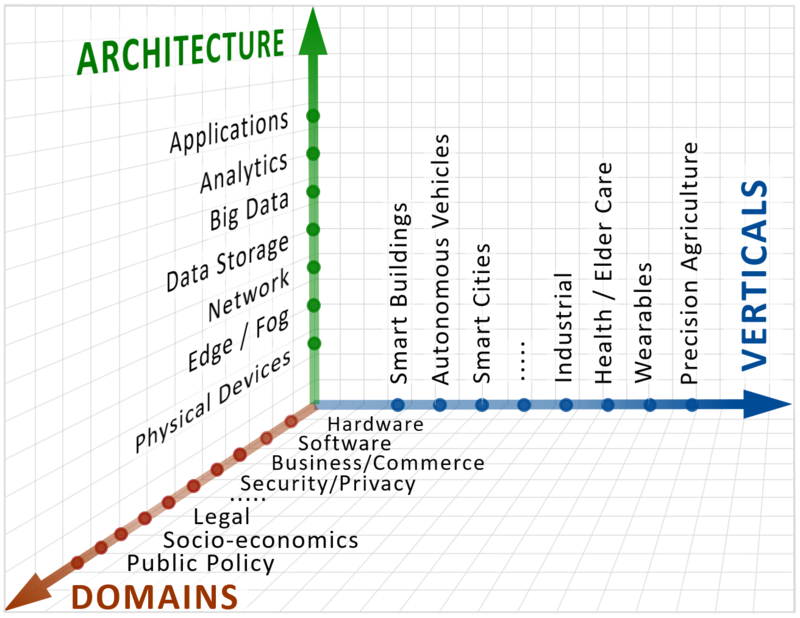 Together, these domains form the third important dimension of the IoT space. Artificial Intelligence (AI), Blockchain, and Cybersecurity are just some of the enabling domains. In return, IoT disrupts and drives reaction in areas such as privacy and network autonomy, human agency in work and society, and legacy business models – all of which ultimately compel new (hopefully) pragmatic public policy. There are ecosystems, and then there are ecosystems. It’s an overloaded term finding widespread use with varied meanings in different contexts. Nevertheless, the common thread in all is a community of mutually dependent members that delve in or deliver different aspects or parts of a common sphere of endeavour and derive mutual benefit. In the case of a regional IoT ecosystem, the different aspects are the three dimensions of IoT – architecture, verticals, domains. The derived benefits include mutual catalyzation and access to talent and innovation, investment attraction, and economic growth. 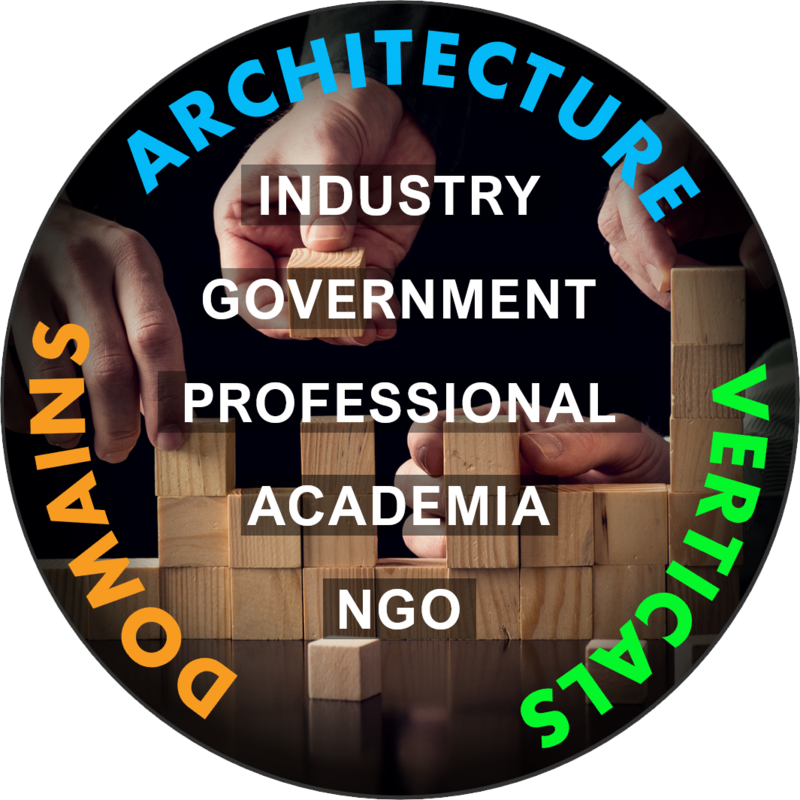 The members or actors of the ecosystem include industry, government, professionals, academia and non-governmental organizations. It’s no secret that Ottawa is a long-established technology hub with one of the highest concentrations of talent in North America. Stemming from narrower legacy sectors such as telecommunications, the region has evolved to a highly diversified ICT economy – a fact that meshes well with the breadth of the IoT space. This gives Ottawa what it takes to be a world-class center or ecosystem for IoT with tentacles firmly placed in all IoT dimensions and a full complement of ecosystem actors. 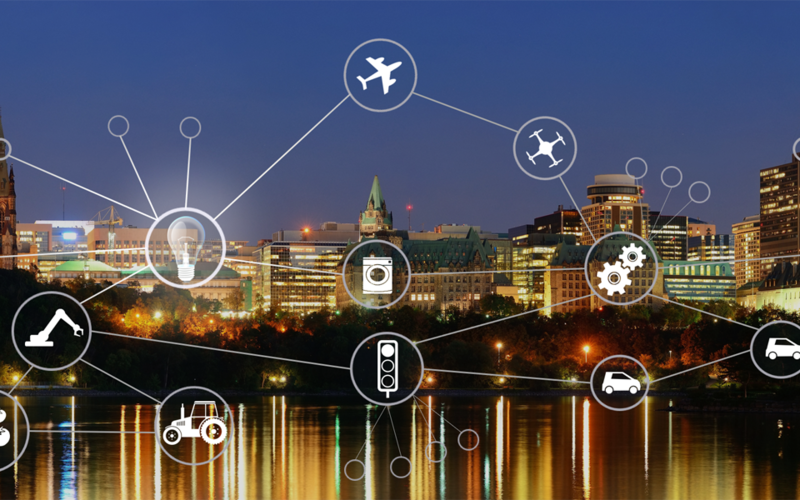 Ottawa is home to many companies delivering the IoT architecture, whether it’s end devices, software components, the network, cloud infrastructure or applications. With too many to mention all, they include the likes of ORBCOMM, Nanometrics, eSight, Wind River, Solace and others providing IoT devices and related software components; Ericsson, Nokia, DragonWave, and ThinkRF with plays in the network; and Microsoft, IBM, and Hitachi with cloud and analytics offers. The Ottawa ecosystem is represented by plays in several verticals such as autonomous vehicles, precision agriculture, smart cities and other. The region is a fast-growing cluster of innovation for autonomous vehicle software with the establishment of the autonomous vehicle innovation center by Ford and Blackberry-QNX. The region has already demonstrated Canada’s first use of live DSRC on city streets within the Kanata North Technology Park and is in the process of establishing permanent four-season autonomous vehicle test area in the region. Precision agriculture is rife with IoT and gaining momentum for Ottawa. The combination of the already present federal research in agriculture, the experimental farm and the city’s own recognition of precision agriculture as an economic development tool is an important addition to the IoT ecosystem. Ottawa is rich in various domains of knowledge and expertise needed to deliver IoT architectures and vertical solutions. Among them is long-held general software and hardware technology development expertise within many product-specific companies. In addition, there are design service providers with growing portfolios of IoT designs under their belt – among them Syntronic R&D Canada, Sanmina, Design 1ST, Fidus Systems, and FLEX. 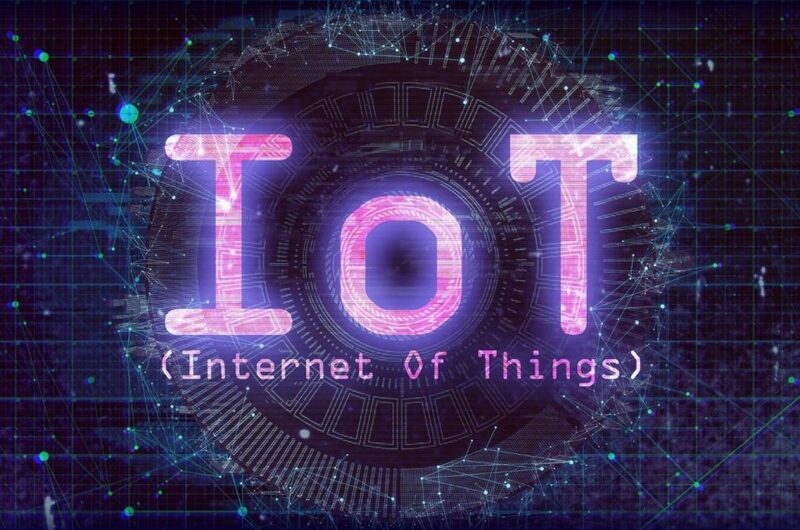 In addition, a specialized set of technologies applicable throughout the IoT architecture and verticals, such data analytics, artificial intelligence, and cybersecurity are well represented by companies like Lixar, Hitachi, IBM, Microsoft, Irdeto, Trend Micro, and TwelveDot among others. Societal impacts are another domain of consideration for IoT. Ottawa is privileged to be the seat of federal government departments such as ISED and Transport Canada, which are key for developing policies to mitigate unwanted negative IoT impacts or side effects – in addition to promoting IoT adoption and innovation. 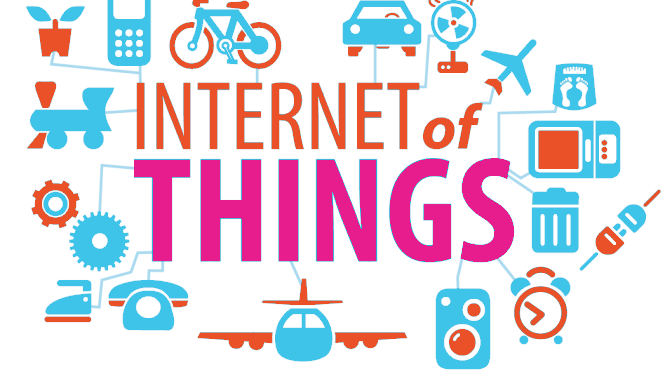 Further, non-government organizations such as the Canadian arm of the Internet Society and CIRA which are opinionated about consumer aspects of IoT such as cybersecurity call Ottawa their home. Adding to the mix above are University of Ottawa, Carleton University, Algonquin College and Collège La Cité with research and programs in many domains of knowledge touched by IoT, in both technology and social sciences realms. The crucial domain of cultivating and promoting IoT-based business and economic growth is addressed by public and private organizations such as Invest Ottawa, OCE, CENGN, L-SPARK, Kanata North BIA and others. These are key for ensuring that nascent IoT enterprises meet real market needs, have a path to capital and attract external investment into Ottawa. An IoT ecosystem would not be complete without actors from a variety other disciplines such as Momentum Business Law to help address the IoT privacy legal challenge and design-in privacy from the start, or Spring2 Innovation to facilitate innovation of IoT solutions and policies using Design Thinking. Lastly, the important role of facilitating mutual awareness among ecosystem members and providing opportunities to learn from each other, interact and connect is provided by IoT613 – such as its annual Internet of Things Conference. Ottawa is a world-class center for the Internet of Things, with ecosystem members across all key dimensions needed to deliver economically effective and socially inclusive IoT – architecture, verticals, and related domains of knowledge and endeavour. If you are an actor in the IoT space in Ottawa – industry, academia, government, professional or NGO – then step into the sphere. Contact us at IoT613 and let us know who you are or join the conversation on Twitter #iot613 or LinkedIn IoT613.